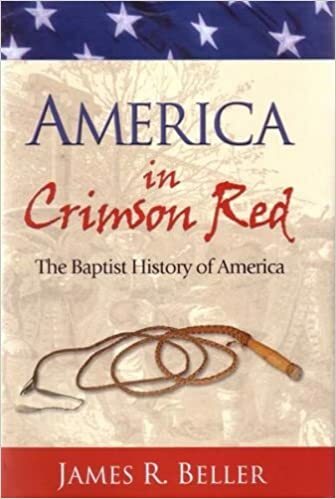 “Here is the soul stirring, non-stop account of the American baptized believers. In these pages are the long forgotten testimony retold with vivid fervor. This is the story of scorn, ridicule, and hatred conquered by sacrifice and devotion. It is the story of one group of Americans who through patience and suffering gave us the America we all now enjoy. The origins of old time religion. The American dissident who shed his blood in Boston for liberty 100 years before the Boston Massacre. The obscure New England native who became the most influential preacher in American history. The revival that led to the Bill of Rights. Harrowing experiences of early pioneer preachers. The true origin of the frontier camp meeting—a unique American phenomenon. The religious cleansing campaign that took place in the foothills of the Appalachians in 1771. Once and for all—was George Washington immersed as a believer at the conclusion of the Revolutionary War? ~from the back of the book; copied from the Sword of the Lord website. Romance Content: I’m pretty sure it did talk about people getting married, but it most certainly wasn’t inappropriate. Recommended age range: 13+, because younger kids would probably be bored. The main thing that bothered me about America in Crimson Red were the numerous typos. Sometimes there were too many commas, and sometimes not enough… so that annoyed me, as I am somewhat of a “comma queen”. 😀 However, I think it is worth it to look over that fact, since it held a lot of excellent information. I think that every Baptist, young and old, should read this book! It will reinforce your faith and inspire you to fight for the distinctives- the truth!- that Baptists have held to for the ages. Highly recommended!